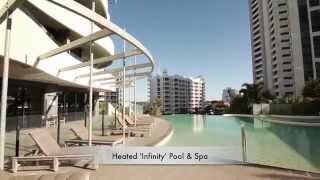 This spectacular resort is perfectly located in the heart of Broadbeach’s Cafe and Dining Precinct and just a short stroll from the patrolled beaches of Broadbeach. Offering sophisticated one, two and three bedroom apartments with views of Broadbeach or water views, plus stunning three bedroom sub penthouse apartments with easterly views. Each apartment is self-contained and equipped with modern kitchen facilities and quality furnishings. The Wave Resort is ideal for couples, families or the astute business traveller. Enjoy access to the exclusive sky pool, spa and sauna located on level 34, or infinity pool, spa, sauna and steam room located on level 4. There is also a poolside barbecue area, fitness room, tour desk, complimentary undercover car parking and free wireless internet access (download limits apply). Their location in central Broadbeach is only a short stroll to Pacific Fair Shopping Centre, Jupiter’s Casino and the Gold Coast Convention Centre. The Wave Resort is the ultimate choice for your next Gold Coast getaway. The Wave Resort is a non smoking building (includes balconies) and has a strict no party policy, offenders will be asked to leave with no refund. All guests must provide photo identification and security deposit upon check in. Located on the top three levels of The Wave Resort, take hold of the panoramic ocean and hinterland views from the balconies that encase the entire room of your Sub Penthouse. These spacious, self-contained apartments offer gourmet kitchens, ducted air-conditioning, separate dining and lounge areas, free Foxtel Platinum package, three bedrooms, two bathrooms and a powder room. Bedding configuration is one queen and four single beds or two queens and two single beds with a AUD15 conversion fee on request. Two Bedroom fully self-contained apartment with second sitting room located above level 11. These spacious apartments feature ducted air-conditioning throughout, open plan dining and lounge area, free in-room Foxtel Platinum package, two bathrooms with separate bath and shower facilities. Both bedrooms and lounge room open onto a balcony offering memorable water views. These apartments are ideal to suit families or corporate business stays. Bedding configuration is one queen and two single beds or two queen beds with a conversion fee of AUD15 on request. One Bedroom fully self-contained apartment with modern fixtures and fittings. Located up to level 11 these spacious apartments feature ducted air-conditioning, open plan dining and living area, balcony with city and limited water views, free in room Foxtel Platinum package, and a bathroom with separate bath and shower. Two Bedroom fully self-contained apartment with contemporary furnishings. Located up to level 11, these spacious apartments feature ducted air-conditioning throughout, open plan dining and lounge area, free in-room Foxtel Platinum package, two bathrooms with separate bath and shower facilities. Both bedrooms and lounge room open onto a balcony offering city and limited water views. Bedding configuration is one queen and two single beds or two queen beds with a AUD15 conversion fee on request. Three Bedroom apartment located above level 12. These extremely spacious apartments offer contemporary style and feature ducted air-conditioning, open plan dining and living area, free Foxtel Platinum package, two bathrooms with a separate shower and bath. Each room opens to a spacious balcony revealing water and hinterland views. Bedding configuration is one queen and four single beds subject to availability or two queens and two single beds with a AUD15 conversion fee on request.